Gwalior is considered as the Gangotri of all gharanas. The style of Gwalior is the unique blend of technical purity, perfection and artistry. 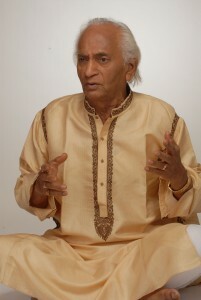 Gwalior Gayaki is based on Dhrupad style with dominant use of Behelava, Meend-Soot, Gamak, Layakari and natural voice culture. Rigourous voice culture is done to cultivate the voice according to the natural qualities, to transverse three octaves with full throated majestic Aakar. Rich treasures of different types of compositions in different Talas and its artistic rendering i.e. bandish bharana, delineation of the Raga according to composition with Ashtang gayaki, correct posture and pronunciation in singing, purity of Raga, correct voice culture are salient features of Gwalior gayaki. For about half the life, the basic Ragas are studied and only later does one learn rare, mixed and compound Ragas. After singing the slow tempo Khayal in single Theka, the delineation of the composition is done with the Ashtang Gayaki (8 fold) i.e. Alap-Behalava, Bol Alap, Taans, Bol Taans, Layakari, Gamak, Meend-Soot, Murki-Khatka-Jamjama with its varieties. All the parts of the Gayaki should be well balanced and if one of them is found weak then the style becomes handicapped. In the movements of Swaras embellishment like Meed – Soot and Shrutis are used. The Taans of Gwalior with it’s wide and intricate varieties are well known and distinct for their marvelous forms, in which each note shines like pearls on a string. While rendering them purity of Ragas and Swaras are maintained throughout. Besides Khayal, the Gwalior Gharana musicians are equal masters in rendering, Tappa, Tarana, Trivat, Thumri, Ashtapadi, Chaturang, Pad and their varieties like Khayal-numa Tarana, Khayal-numa Tappa, Tapp-khayal, Tapp-tarana, Tapp-thumari etc. Because of intensive training of these forms, all Rasas are evoked. The Gwalior Gayaki has such a unlimited scope for imagination that musicians of this style distinctly reflect their own personality besides the stamp of the Gharana in their singing. My father Pt. Krishanarao Shankar Pandit used to call it a tradition instead of a Gharana, as the meaning of the word gives some misunderstanding. Gharana did not mean being part of a musical or particular family, it is related to a particular style only. According to him a Gharana is only established if it has a tradition of at least three generations, with a Guru of a very high calibre. He is of the opinion that for an artist to belong to a Gharana a training period of 12 years or one tapa as it is called under the tutelage of a Guruwas essential. Gwalior style is a very intricate and effective one, as the musicians of this style sing all the forms of singing which evokes all the emotions or the Rasas. The basic instruments used while practicing are Tanpura and Baiyan which keeps the drone and rhythm by the right and left hand respectively. One has to practice rigorously while playing Tanpura by the right hand and Baiyan by the left hand simultaneously to obtain mastery over Swar and Laya i.e. notes and rhythm. That is why musicians of this style allow the accompanying Tabla players to play freely.